Adam Carruthers in Culture & Arts Drama on 17 March, 2019. At the start, there is some great banter. Max Greenhalgh as Elliot (15) and Ariana Van Biljon as Maggie (14) have excellent chemistry on stage. Elliot crudely evokes the menstrual cycle to wrestle control of £200 from his younger sister (“You can’t trust something that bleeds for five days and doesn’t die”). Add in the excellently played Alexander Cohen as Finn (10) who embraces the childish nature of his character but doesn’t go overboard – a particular highlight was the Michael Jackson dance moves. Make no mistake however, a dark shadow is cast over the young characters by the absence of their mother. The playful nature of the kids mixes with their deep desires, great fears and fierce loyalty to each other, and is allowed to run amok without parents home for over a week. Elliot in particular becomes extremely neurotic and controlling over the play, chillingly portrayed by Greenhalgh. This is the strength and weakness of the play. These eloquent, complex, hurt individuals are fantastic to watch but difficult to believe are adults, which makes it harder to submerge yourself in the story. The supporting characters of the play suffer a different problem. 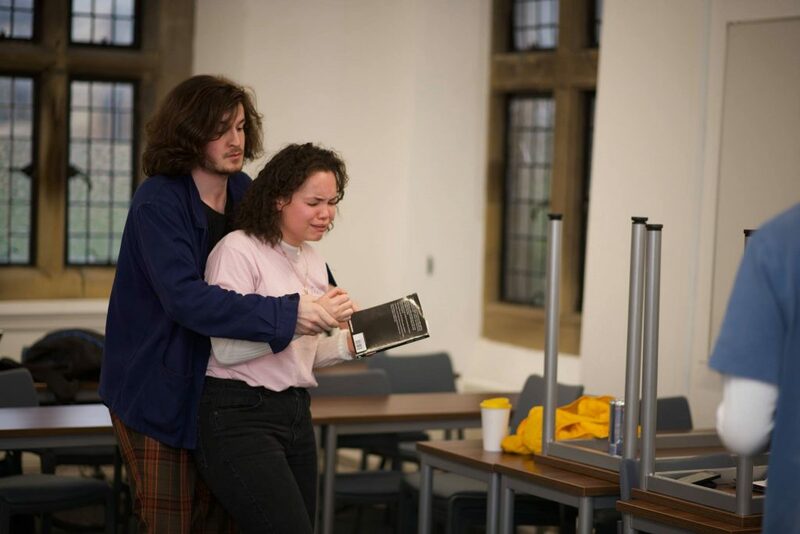 You could not get to know the angry neighbour, the troubled couple, the girlfriend, well enough within the time they had in the play, and their behaviour within the context of the story was strange. However, the actors did the best they could with them, including the middle-class couple’s humorous polite observations of the hellhole that the set had descended into. Credit must go to the director Iz McGrady for the blocking of the play. In the very difficult Kingsgate room, space was used very effectively. The creepy, near incestuous love between Elliot and Maggie on the table. The cornering of people. The touching moment Finn joins a sobbing Maggie on the floor. The chaos of the strewn trash (side note: the cast and crew of this play must have eaten a lot of crisps in the name of this production). The tech for the play is good on the whole: it is tricky to do anything super creative with a bog-standard scene in a flat. It must be said, however, that the choices of music playing throughout the piece are excellent, fitting the mood but not becoming overpowering. All in all, Tusk Tusk will draw you in with its intrigue and brilliant character development: it is well worth watching. Fourth Wall Theatre’s Tusk Tusk is on 15th-17th March at 7:30pm in the Kingsgate Room at the DSU.